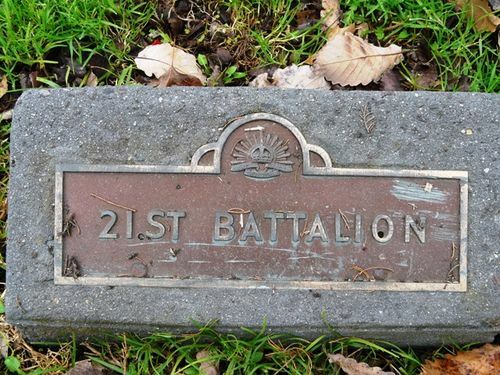 The plaque which was planted at the base of a tree commemorates those who served with the 21st Infantry Battalion during World War One. The tree was planted on the 4th August 1934 and was No. 18 in the ballot. The Battalion was raised in 1915 as part of the First Australian Imperial Force for service during World War One and formed part of the 6th Brigade, attached to the 2nd Division. It fought during the Gallipoli campaign and on the Western Front before being disbanded in late 1918.